Pottery Mark Query on vase with initials S.L.R. and signature "gualdo" something "shire" and Made in Italy :- This item belonged to my grandmother July 22, 1911 through May 15, 2011 may she rest in peace after 99 years of a great life. This vase was in her house all of my 40 plus years of life or at lease as for as long as I can remember. There are other items this is the first that I'm attempting to have the mark identified from the forum visitors of this site. 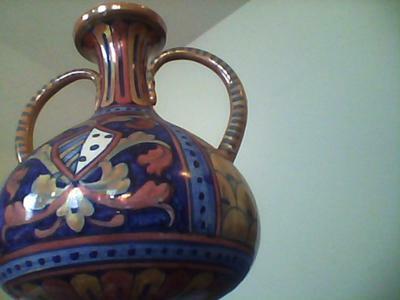 This looks like a typical Italian provincial earthenware majolica style hand painted ceramic. There is a long and well established tradition of this type of Italian maker going back many years. Almost every town and city has its own local traditions in this style and there are so many small units they would be impossible if not pointless to catalogue. If I were you, I would work out as many different variations of the mark that you can muster and put each of these keyword phrases in turn into a search engine - Google and/or Bing. You need to take your time and be quite scientific about it. In the meantime, if anyone has a piece with this pottery mark let us know what you have - it all adds to the knowledge base. I have a pitcher with "S.L.R. made ex italy." The colors and style on our pitcher are similar to yours. Did you find any information about your piece? Our pitcher was passed down from our grandmother. This is Anthony I haven't found out anything else on my piece, sorry Linda. Did your piece have a signature, and if yes who's signature is it? His vessel contains the signature of the manufacturing Società Luca Della Robbia, is a vase made ​​during the period from 1925 to 1938. It has a special design. Good evening. Thanks, because all I knew was that it was made after 1980. Now I'm wonder about how much this piece is worth. Many thanks to Nazzareno for that perfect assist! Another coup for this site. Just to explain a bit more about what this 'SLR Gualdo Tadino' mark is all about - let me first say that at first, I had no clue at all. I did some research and pieced together the information bit by bit. Luca della Robbia was a famous artist from the Italian Renaissance working in the mid 15th century. He came from a wealthy family of textile merchants who were named after the famous Italian red textile dye 'Madder' (in Italian 'Rubia'). Della Robbia/Rubia was an architectural sculptor of bas relief religious scenes and a well regarded artist admired by his piers. His work is prominent in the Cathedral of Florence where he was working alongside the likes of Brunelleschi and Donatello. Luca went onto develop the technique of making architectural sculptures in fired ceramics, rather than marble, and in this work was a European pioneer. As far as I can find out about it (and all the online information was in Italian), the "Società Luca Della Robbia" was formed in 1925 (as Nazzareno so helpfully identified) and named in homage to the great Renaissance ceramic artist Luca della Robbia. Here are a selection of different SLR marks I unearthed. I couldn't find out too much about the people involved in this company set up, as information seems to be somewhat scarce online about this company, but I can see from the various pottery marks that the words "GUALDO T" or "GUALDO TADINO" are used a lot as well as "L. Robbia" and "S.L.R." and also "S.C.L.". I found out that "GUALDO TADINO" is not a person but an Italian village famed for its ancient ceramic making and innovations especially for architectural ceramics on churches. L. Robbia is a reference to the renaissance artist. Not sure what SCL stands for. At first, this company apparently just made reproductions in the renaissance Gualdese Umbrian style (ceramics centred at the village of Gualdo Tadino in Umbria) and copies of ancient ceramics. The company was reformed and restructured in 1938 but continued to make and was sold to a larger concern in 1975. Today the term "Della Robbia" has been coined to have a more general meaning - to indicate a certain type of garlanded pattern - especially on majolica vases and more especially on very highly expensive and collectible art vases from the American company Roseville (whose "Della Robbia" art vases sell for many thousands of dollars at auction). Whilst researching I found a late 19th century pottery also making in the village of Gualdo Tadino, Umbria calling themselves the The Rubboli pottery. The name and hand written signature is similar, but it is not the same firm. I am not sure if this family name is derivative of the Renaissance artist's descendent. I do know these plates are expensive at auction and are in the V&A museum London and very beautiful and inspired English potter William De Morgan to produce his Aesthetic Art & Crafts pottery. Frankly, I don't think the "Società Luca Della Robbia" would be in the same price bracket, as either the Rubboli pottery, or the Rosewood as they lack the notoriety and age. 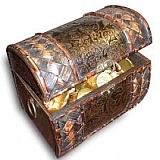 However, they are undoubtedly nice items and give it time. I wouldn't be surprised if nice examples like yours went from between $200 - $400 USD at auction, unless within a specialist or local Italian collectors sale, where people have actually heard of this somewhat un-notorious company. I did see Gualdo Tadino (not SLR)vases sell in US auctions for a few hundred each. A pair of Rubboli vases were put up for sale with the estimate of $1200 - $1500 (with a starting bid price of $400), but they failed to sell. The bottom line is, I am not an expert and I can't value things, so my guess may be way out, and they may be worth thousands or pence. Who knows? ppps. I also discovered an English 'Della Robbia Pottery'. It was located in Birkenhead established by students of Ford Maddox Brown, a leading light in the Victorian Art & Crafts movement. They made beautiful Art Nouveau wares inspired by Luca Della Robbia and the Italian majolica wares of Gualdo Tadini. They produced a range of art pottery which they sold through Liberty of London. 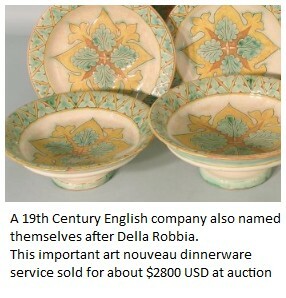 I saw an amazing and important dinner service sell at auction for about $2800. 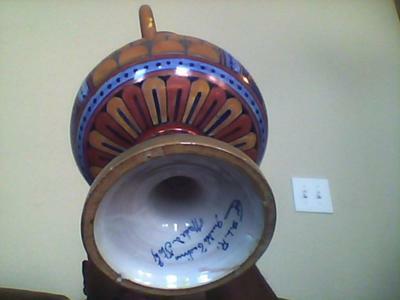 I believe I recognize the style of ceramics, which is unique in the world. It can only be found in Gualdo Tadino, a small village in Umbria, Italy. In the late 1800s Paolo Rubboli had the secret to red and gold coulours in lustre ware. A process which requires 3 baking sessions in really old furnaces. His sons Alberto and LORENZO Rubboli continued the trade. There is a museum in the village for their ceramics. You have a unique piece there. Enjoy it!